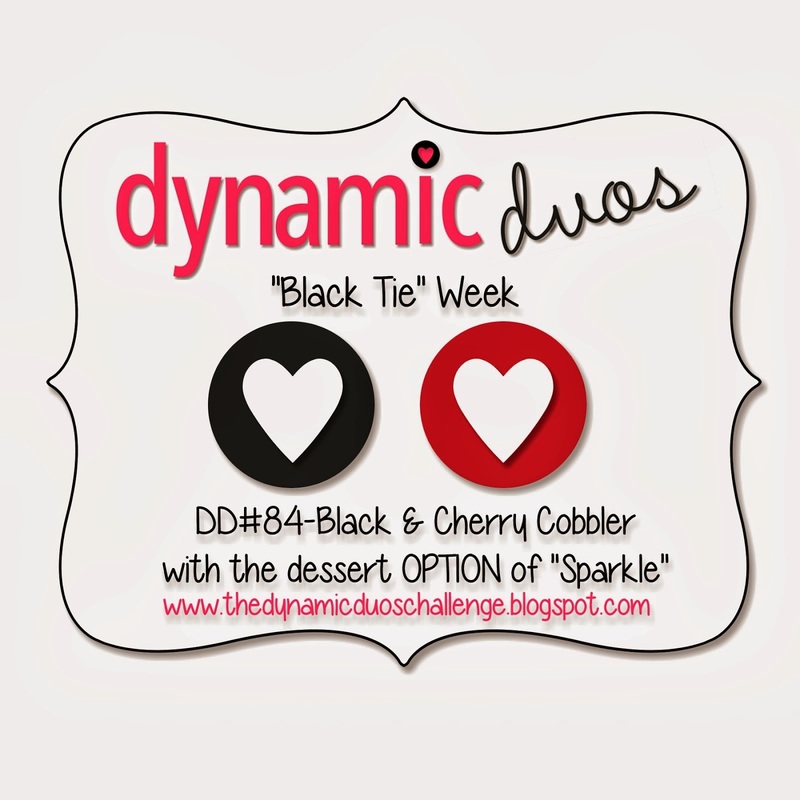 There is just something classy about Basic Black, Shimmer White and Cherry Cobbler, like the Dynamic Duos Black Tie Challenge this week. 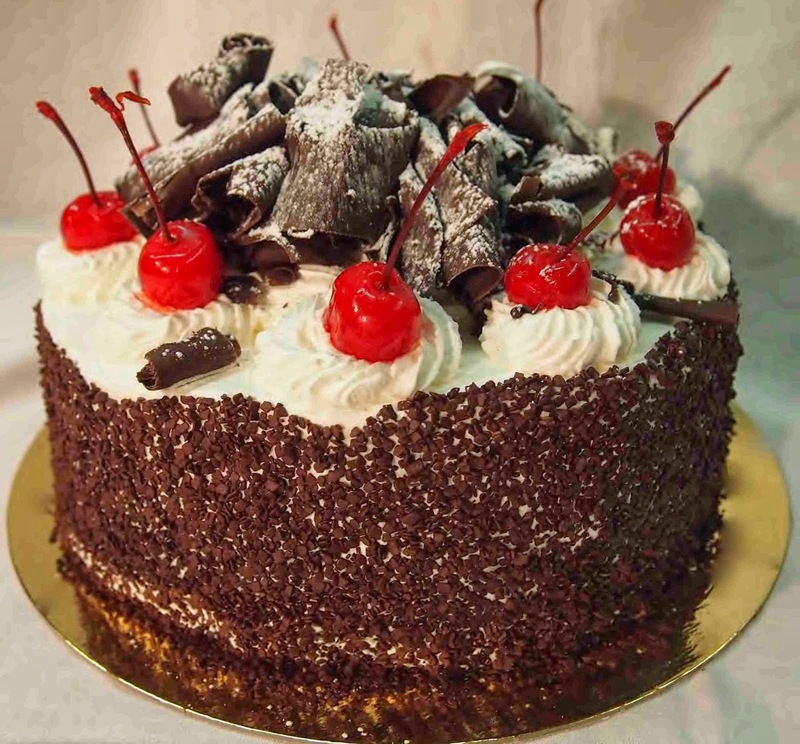 It reminds me of one of my favourite cakes - Black Forest Cake. 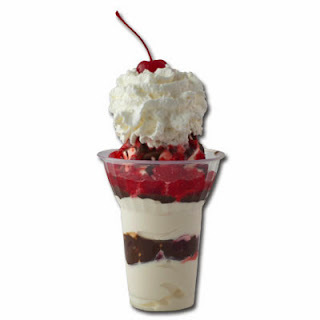 Or one of my favourite sundaes - Chocolate Cherry. 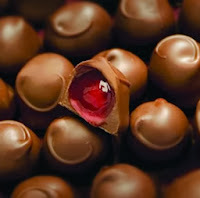 And one of my favourite chocolates - Cherry Blossoms or Cherry Cordials. Okay, now I'm hungry. Be right back!! I love cardinals at Christmas and while the Bird Builder Punch doesn't make cardinals, you can add the crest using one of the leaves from the little sprig that punches out with the birds. I used the Hearts Collection Framelits! I say that with an exclamation point because I hardly ever use them except for Valentine cards. The white cardstock, though hard to see in the photo is the Shimmer White cardstock. 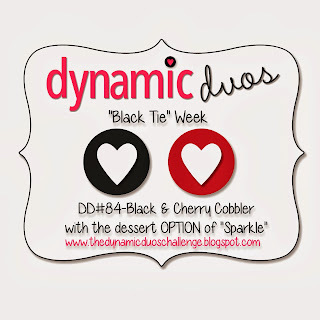 It adds the sparkle that's the dessert option with this challenge. The sentiment is from Warmth and Wonder, a hostess set from the Holiday Catalogue. I love it and have used it a lot. If you want it, you're going to have to book a private class with some of your friends before January 2. After that it will be gone! I tried the Cherry Cobbler 1" Stitched Edge Grosgrain ribbon for this card but the Cherry Cobbler was a bit subdued with that ribbon. I could have used seam binding ribbon, but I'm all out of Cherry Cobbler, so Chevron ribbon it was. The Shimmer White panel, the birds' wings and the birds themselves are all popped up on Dimensionals. The birds' heads needed a double layer because they were adhered to the lower Basic Black layer, not the higher Shimmer White paper. By the way, chocolate covered cherries are the best, but chocolate covered cranberries come a close second and it's what I had in the house when the chocolate craving overcame me! And dark chocolate is so much better that milk chocolate! For the next week, I will be taking some time off to spend with my family. I will be posting some of my favourite cards from 2013, so I hope you enjoy that. I will be back with some fresh material on Dec. 29, just in time to say good-bye to the Holiday Catalogue. You can still visit my On-line Store 24/7, or give me a call if you need anything. Merry Christmas to you and your family! Leave me a comment and let me know your favourite flavours! Love your Black and Cherry Cobbler card!! The cardinals look wonderful against the Shimmery White card base and Basic Black heart (great tip regarding their crest :-)) Thanks for playing along with us at the Dynamic Duos- Merry Christmas!! What sweet birds.. I love this! Great use of the challenge colors. Thanks for joining us at The Dynamic Duos.